Our old world recipes use only top quality, wholesome ingredients. They are naturally cholesterol free and trans fat free. True to the original pita tradition, we hearth bake each bread to a perfect golden brown. Toufayan Pita are convenient and versatile. Just cut in half or at the top and fill with meats, salads or cheese. Great for tacos, sloppy joes and fajitas, or cut into bite size pieces for appetizers. The Toufayan family is proud to make the finest tasting and healthiest breads for your family. We're always glad to hear from you, so if you have a moment, drop us a line at info@toufayan.com or leave a comment below. Hello from The Bahamas. Really missing the oat bran,any update on that product? Thank you for your interest in our Oat Bran Pita. We appreciate your patience as we work on our new Oat Bran recipe. In the meantime we do have other options for you and your family to enjoy. You can find more Pita varieties on our Products Page. Once our Oat Bran Pita is ready for distribution, you will find it there so keep a look out! how can i order the pita bread from you guys??? Toufayan Bakeries ships to distributors who ship to your local supermarket. At this time, our facilities are not set up to ship individual cases or smaller orders across the nation. Please ask your favorite grocer to add Toufayan products to their inventories or to contact us directly. Ask them to call 800-328-7428 or visit our contact page. You may also find stores in your area that carry Toufayan products on our where to buy page. From there you can click on your state to see a list of stores that are part of our distributor’s reach. Please let us know the responses from your store managers or if you find any other way to order or buy our products in your area. Hello! Our family absolutely love your product! We used to buy OAT BRAN a lot, but now it is impossible to find this particular pita bread in our grocery stores in South Florida. We placed an order at local Publix not once, but unfortunately we were told that Toufayan has discontinued making Oat Bran. It’s sad because you have Toufayan Bakery in Florida but for some reason we can’t buy the product we love and had been baying for years. What happened? Thank you! It fills us with joy to hear that you and your family love our Pita bread products! Yes, we have discontinued our Oat Bran Pita; however, we are currently working on a new Oat Bran Pita recipe. In the meantime we do have other options for you and your family to enjoy. You can find more Pita varieties, along with updates to the new Oat Bran Pita on our Products Page so check back soon! Does Toufayan still make the whole wheat pre-cut pita? That was my favorite but I haven’t seen it at my grocery store recently. Thank you for your interest in Toufayan’s Hearth Baked Pita. Our round Pita is not pre-cut although we do bake Whole Wheat Smart Pockets. These are pre-cut and ready to be stuffed with your favorite ingredients. Enjoy! I was curious if your Whole Wheat Pita Hearth Baked is vegan? Thank you for your interest in our Hearth Baked Whole Wheat Pita. While they are not vegan, we do have products that are in fact vegan certified. You can find more info on our Product Groups page. Is there an expiration date on the whole wheat pita? Date codes are applied by your grocer. Sometimes they print them on the package off-center near the front. Sometimes they print them along the ruffled top-opening or on the twist-tie. Grocers might use a sticker, or price gun to apply a code date, in which case they are typically white rectangles with a 6 digit date code that represents the ‘best if used by’ date. Toufayan Hearth Baked Pita have a 5-6 day shelf life and should be eaten or frozen before then. We recommend you ask your store manager for details. Up until a few years ago I used to be able to get Toufayan Flat Pitas in my local grocery store. They were the same as the regular pitas, only flatter and larger in diameter and I loved making pizza with them as they produced a crispy thin crust. At 120 calories and a couple of grams of fat per loaf they were healthier than your Flatbread which has 200 calories per loaf and 11 grams of fat. Do u still make the flat pitas. I miss them. Please try our Hearth Baked Low Carb-Low Sodium Wraps with only 100 calories and 3.5 grams of fat per wrap. Or, try our new line of Organic Sprouted Whole Wheat breads. Check out these great recipes for homemade pizza! Please let us know if you have any questions, and feel free to contact us directly! I live in an area where no one carries the Whole Wheat pitas. In fact, I have to travel to another state to get it. What do you suggest for folks like me? Would you consider selling yourself from your website? We’re not able to sell our products direct to consumer via our website because of logistical concerns, however there are some third-party services that do resell online. If you do find them on the web, please comment here and tell us about your experience! If you have further questions, please contact us directly. I had sent a post so I’m hoping this is not a duplicate. I purchased the low-carb pita as I always do. I noticed the packaging changed. I looked at the nutritional label and WOW..increased calories and carbs. My husband, who is diabetic and myself love them for steak sandwiches, burgers, and sloppy joes. I came home and checked the web site and it is still showing the original 100 calorie 6 net carbs. I’m so sad. What happened? Thanks for your comment. We did have to update the recipe, but we hope you enjoy it. We’ve updated the image and nutritional information on this website to match the new packaging. The new recipe is 13 net carbs and 130 calories, with less sodium and more calcium than before. Please contact us directly and let us know if you have any more questions or comments. I have a sesame allergy and was wondering if I would be able to eat your pita or naan. Is sesame an ingredient or any chance of cross contamination in either of those? Thank you. Our Pita and our Naan are made without sesame and are not processed on any equipment that processes sesame. Our Organic Naan contains sunflower oil and some of our Pita contains soybean. Enjoy them in good health! Where can I find an ingredient list? I have a child allergic to rice, corn, soy and all nuts except cashew so want to ensure the pita’s dont have any of this before buying. Thank you! Ingredients: Wheat flour, enriched wheat flour [contains niacin, reduced iron, thiamine mononitrate (vitamin b1), riboflavin (vitamin b2), folic acid], water, oat bran, wheat gluten, yeast, contains less then 2% of each of the following: sugar, cellulose fiber, salt, calcium propionate (added to maintain freshness). Processed on equipment that also processes soybean. Let us know us if you’re interested in learning more about any other varieties or products. Do you use iodized salt in your pitas? Hello Erica, thanks for your interest. We don’t use iodized salt at all. Your Gluten Free Wraps are AMAZING!!! Sandwich wraps and Taco Tuesday are delicious once again since getting a Celiac diagnosis . You have no idea how much we appreciate your GF products. Is there any chance you might make GF pitas? We’re so glad you and your family enjoy our Gluten Free Wraps! We’ve been testing the perfect recipe for GF Pitas, but we’re not quite there yet. We’ll be sure to announce it when they are ready. Are the Organic Sprouted Whole Wheat Pitas made with nuts, sunflower, chickpeas, or milk? Do they share the same equipment with nuts, sunflower, chickpeas, or milk? I have purchased your whole wheat pita for 20 plus years because it’s the best and healthiest pita on the planet. I used to be able to purchase them most recently at the local Wichita, KS Walmart and previous to that at the local Dillon’s. Lately, I haven’t been able to locate them anywhere. I am SOOOO disappointed that I can’t find them. Where can I purchase them at? Thank you for your support, Karen! You can request that Walmart continues to stock our Pita by going to corporate.walmart.com to leave a comment or call them directly at 1-800-925-6278. Ask your favorite grocer to stock our pita, you can have them call us at 1-800-328-7482 or ask them to visit our contact page. In Wichita, KS, you can try Balls Food Stores – they carry our Pita Bread. You can use our store finder for more details and areas. Let us know if you find it somewhere else in your area, if you need help looking or if you have any other questions. Bought a package of the sweet onion pitas. Have tried everything possible to get them open to put something in them. They are to thin and tear. The flavor is good but doubt I will buy again as I can’t make anything with them other than eat them by pieces. I’m sorry to hear about your discontent with our pita. We are torn (no pun intended) between making thinner pitas that are easier to open and heartier pitas that are thick enough to withstand any ingredients but aren’t as easy to open. We recommend slicing across the pita about one quarter from the edge. Slightly heating the pita in a oven or microwave also causes the air pockets inside to swell a little, aiding in separation. Please let us know if there is anything we can do so that you will give our pitas another chance! Does your classic white pita contain any animal derived ingredients? Thanks! Our Classic White Pitas are not certified vegan, however, we don’t use any non-vegan ingredients. While we do use calcium propionate, which can be made with vegetable or animal fat, we use only vegetable fat calcium propionate. Ingredients: Enriched wheat flour, water, yeast and less than 2% of each: sugar, salt, and calcium propionate (added to maintain freshness). Thank you for your interest, please feel free to share any comments or questions! I bought a bag of your pita bread at Kroger. It is so thin that when I try to open it to fill it it falls completely apart. Many of our customers enjoy the thinness of our heath baked pita. However, I know that it can sometimes be a challenge to open them perfectly. We have found that they are much easier to open if they are very fresh and a little warm. If you would give us a second chance we would be grateful! Would you like someone from Toufayan to contact you? My son is anaphylactic to sesame seed and sesame seed oil are any of your pitas made with these or on shared lines if you processed products with sesame seeds or sesame seed oil????? Hello Michelle and thank you for your question. We understand your concern and we strive to make our products as safe, wholesome and healthy as we can. After all, we serve them to our family as well as your! You can rest assured that our Hearth Baked Pita does not contain any sesame seed or sesame oil and they are no processed on any equipment that processes sesame seeds or sesame oils. Enjoy them in good health! Please note, some varieties of our Crispy Breadsticks, Pitettes, Mini Pitettes, Bagels, Mini Bagels and Smart Pockets do contain sesame seeds and therefore may be processed together, but such products do not share equipment with products that do not contain these ingredients. Thanks again and please feel free to ask any other questions you may have, or leave your comments. I think I could live off of just this bread and hummus. So good! I have a deli in South Dakota. We like to use 8″ pita bread for sandwiches. Do you have any wholesalers in South or North Dakota, Iowa or Minnesota? Hello Ted and thanks for your interest. Please contact us directly, via 800-328-7482 or email info@toufayan.com and we’ll put you in touch with someone who can help you. 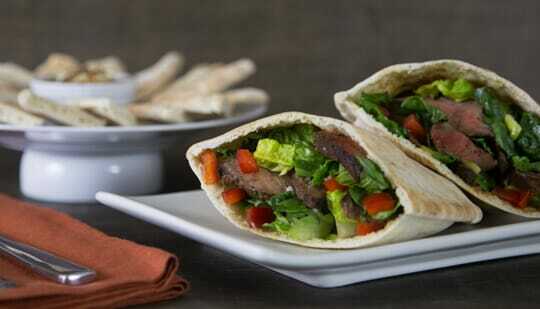 Hi I have been trying to eat healthier and have switched over to your pita bread I’m loving it. (Go Sweet Onion). I do have a question is your pita bread unleavened??? Just curious thank you Love the bread. Hi Jack, our pita bread is leavened. All of our breads contain some yeast. You can learn more about our products on our certifications page. Thanks for your interest and enjoy! Your pita is very delicious. I would love if you created an organic version, to be assured the wheat is free of chemicals. I would pay more for organic. Please think about it. Your bread is very very yummy. We are working on Organic Sprouted Whole Wheat Wraps, Pita and Smart Pockets™, and you should be able to get some at your favorite grocer very soon. Our bakers are also working on some very tasty Organic Naan and Organic Garlic Naan! Stand by for more details on this website! Are your Multigrain Pita’s Vegan? Hello Katie and thanks for your interest. Our Multigrain Pitas are not certified vegan, however, we don’t use any non-vegan ingredients. Calcium propionate can be made with vegetable or animal fat, while we use vegetable fat calcium propionate, without official certification it is very difficult to confirm. Ingredients: Stone ground whole wheat, flour, water, enriched wheat flour, wheat gluten, yeast and less than 2% of each: sugar, salt, cracked wheat, rye, yellow corn grits, oats, triticale (wheat/rye), brown rice, flax seed, soy flour and calcium propionate (added to maintain freshness). You can checkout our certifications page to learn about which of our products have been independently certified. Thanks again and please feel free to share any comments or questions! Like Florida or maybe Trader Joe’s? We have a strong presence in Florida. We do a lot of our baking at our facility there! Check out our store finder for more details. Please be assured, we use absolutely no pig in any of our products! Enjoy! Which of your pita breads is sodium-free? Or at least the lowest in salt? I have high blood pressure and am super sensitive to salt. At the RiceHouse medical clinic in Durham, North Carolina, your pita is served. I’m wanting to be able to buy it myself in Naples, Florida. Would you be so kind as to tell me which store/s might carry it there? Please? Our Pita Bread varieties mostly contain a similar amount of salt, though the Low Carb Pita Bread has less sodium than the other varieties. However, we do offer No Salt Classic White Pitettes® and No Salt Whole Wheat Pitettes®. Let us know if you still have any questions. I want to know if any natural flavor used in your products undergoes processing with ethanol. This can be answered by your technical department or quality analysis department. We spoke with our bakers, and confirmed with our suppliers, the ingredients used in our Pita bread do not contain or use ethanol at any stage. Thanks .the same policy with hearth baked flat bread? Please feel free to contact a Toufayan representative directly at info@toufayan.com, however, you can be sure that we use no ethanol in our Hearth Baked Flat Breads either, at any stage. In our pita bread, and in many of our products, we use only calcium propionate to maintain freshness. Our shelf is not expected to be very long, we do not use any TBHQ to extend it. Great, so glad to know this! May I ask where I can see the expiration date of the pita bread? I bought one today from a supermarket. There is no any date on the package but a code–32116N 02:10 TNJ. The code date is meant to be stamped or printed by your grocer. Often, we see them printed on the twist lock (the little plastic piece that holds the bag closed). Some grocers print the date directly on the plastic bag. The shelf life of our Pita bread is 5-6 days after defrost. Can you tell us which store you the Pita came from? I have been buying Toufayan Whole Wheat Pita for several years. I keep mine in the freezer, taking out only what I need. This has worked wonderfully for me, with no loss of quality. Of course, they are never in the freezer long enough to get freezer burn, so I have no answer to that possible question. The real reason I am commenting is because I am sure that the Pita I’ve gotten in the last month or two are smaller than what I was used to from Toufayan. They don’t seem to be thicker, which might account for the smaller diameter, just not as big. Has something changed? Thanks so much for your loyalty, we are glad you can rely on us! Nothing should have changed in the portion size of our pita. However, we will talk to our bakers about it! Can you let us know where you usually purchase our pita? Please feel free to contact us directly at info@toufayan.com, or just reply here. Since my family consumes your pita bread on daily basis I would like to know more about it. Could you please be kind and tell me from where does your whole wheat flour (or wheat) come from? Is it GMO? Is it organic? I’d appreciate your prompt response to this post. Hello Merv, we’re glad you and your family enjoy our pita! Our new Organic Sprouted Whole Wheat Pita is certified organic by the USDA, though they have not yet received official Non-GMO status. We strive to use the highest quality, safest and freshest ingredients in all of our products. You can learn more about our certifications on this site. Check back often as we are always looking to improve our products, with your families in mind. I live in South Carolina , can I order pita bread online ? We do not ship directly to consumers, however you can find Toufayan Pita Bread in South Carolina at Bi-Lo, Kroger, Piggly Wiggly and Walmart. Each store manager may chose to carry different varieties. Please ask your grocer to add your favorite Toufayan products to their inventories. You can use our Store Finder, to check for availability updates! Is your whole wheat pita made with flour that is enriched with folic acid? Love the pita, but I’ve been diagnosed with a genetic condition in which my body cannot properly methylate folic acid (the synthetic form of folate) that is added to most enriched flours in the US. Ingredients: Organic Whole Wheat Flour, Organic Sprouted Whole Wheat Flour, Organic Yeast, Organic Fermented Wheat Flour, Organic Vinegar, Salt, Organic Honey. Check your local grocer or ask your store manager to add it to their inventory. can your pitas be frozen for later use? We have found that they do freeze well, just ensure that they are well sealed before placing them in the freezer. A vacuum sealer works well or plastic freezer bags with the air carefully removed. You will also find that it is better to chill them in the refrigerator for at least twenty minutes before placing them in the freezer, to reduce condensation. When you defrost them, a slow defrost overnight in the refrigerator works great! Once you defrost them, regardless of the code date, don’t leave them in the breadbox for more than three or four days (they usually get eaten before long anyway). I LOVE your low-carb pita bread! Are the freezing instructions for the LC pita bread the same? Yes, you can freeze the Low Carb variety just like other pita breads. Thanks for your endorsement! We recommend you chill them first. Ensure an airtight seal with little or no air inside the package, to minimize condensation (I use one-gallon freezer bags). Transfer to the coldest part of your freezer (the bottom usually) after about 30 minutes in the fridge. Keep them frozen for up to 3 months. Defrost overnight in the fridge, or on the counter for about 4 or 5 hours. What is the largest pita bread size you carry? I thought there used to be a larger, thinner pita bread available. Our Pita Bread is approximately 6″ across. Currently we don’t have anything larger, though we do have smaller ones (Pitettes® and Mini Pitettes®). What sizes were you hoping for? Perhaps we’ll talk to our bakers about a specialty, larger version! I brought this pita bread at Publix. When I cut it…it was like there was no pocket, no matter how I tried. I couldn’t even do it with a knife. Your picture looks good, but disappointed cause I wanted to do burgers in pitas. Thank you for contacting us regarding our Toufayan Pita. We are a family bakery and really appreciate you contacting us. Your pita should have pocketed and we are sorry that it did not. Sometimes when the pita is made on super humid days, it really effects the elasticity of the dough before its baked. Please contact us directly at 800-EAT-PITA (800-328-7482). How do you make your pita’s all the same size? Our pita bread actually varies a little from loaf to loaf. We try to stick to grandpa’s recipe as best we can, which produces approximately the same size pita each time, but subtle variations are noticeable. Thanks so much for noticing that they are very similar, Dad will be proud to see we’ve been consistent! Hello! My entire household loves your products! I am writing to inquire as to whether your bakery has been affected by the recent recall by Grain Craft flour, due to contamination with peanut flour. We have severe nut allergies and want to know if we can continue to safely eat your product. Thanks! Hello Katie and thanks for your endorsement. Toufayan Bakeries is not affiliated with Grain Craft or its South Georgia Mill. You can find details of the Grain Craft recall on their website. Further information can be found on the FDA site,confirming that Toufayan is unaffected. You can safely continue to enjoy our Pita Bread! I only buy your bread, most always Whole Wheat but if none available then any otherToufayan Pita will do. I load my bread up like a pizza and eat that way. All my friends come over just for my Super Pita Sandwhiches. I am well known for my Pitas in my circle. Thank you for the best bread on earth. Wow Bob! Thanks for your endorsement! We love ’em too. Don’t miss our wraps, I love to feed my friends and family Super Wrap Sandwiches too! We’re glad you like them so much. If you send us your favorite recipe we’ll post it on the website! It would be nice if the whole wheat pitas were also sold in a family size. I am assume this would also lower the cost per pita. Hello Jim and thanks for your feedback! How many pitas would come in your ideal family pack? We’ll be sure to pass your suggestions along to our bakers and reps! Unless I am mistaken, 2x would make them similar in calories to a typical loaf of sandwich bread. So, 2x or more. Yes I wanted to check the ingredients list of your Pita Whole Wheat bread. Give it a try and let us know what you think! Why must you put a chemical like calcium proprionate in your bread? I think I used to buy this product before it had that chemical added. I would rather cut away some mold than eat unnatural substances. Calcium propionate is a type of salt and along with sodium propionate is effective against both B. mesentericus rope and mold, which can cause serious illness. Calcium propionate is easily processed by the human body. The Center for Science in the Public Interest describes the additive, “The calcium is a beneficial mineral; the propionate is safe”, and indicates that “calcium propionate is added to bread products to prevent mold growth”. This has been a valuable resource in the bakery industry for a few decades now. Hello Tanya, please ask your favorite grocer to add our Sweet Onion Pita to their inventory. Meanwhile, you can contact a Toufayan representative via our contact page or email us at info@toufayan.com to request the option for delivery. A deliciously simple treat for two! ©2015-2018 Toufayan® All rights reserved. Designed and maintained by insomniagraphix. Toufayan Bakeries - Find us in your supermarket's deli section.